Don’t spend your Saturday night at another boring, cookie-cutter country bar. 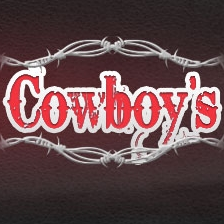 Instead, experience refreshing drinks, live entertainment and upbeat music at Cowboys. Whether you want to nod along to the music while you play a game of pool or steer your partner onto the dance floor after a cold one, our country western nightclub is the place for you. Visit our private nightclub in Tyler, TX today to catch our next concert. We welcome new members. Visit the Photo Gallery page now to get a look at our spacious nightclub, then stop by this weekend. We can’t wait to see you! We’re the largest nightclub in Tyler, TX. We feature weekly drink specials and a wide variety of shareable food. We play all kinds of dance and country music, so you’ll always hear something you enjoy. Call 903-266-9377 now to learn more about Cowboys. We’re open Thursday-Saturday every week. Please note that we are a private club with memberships available.